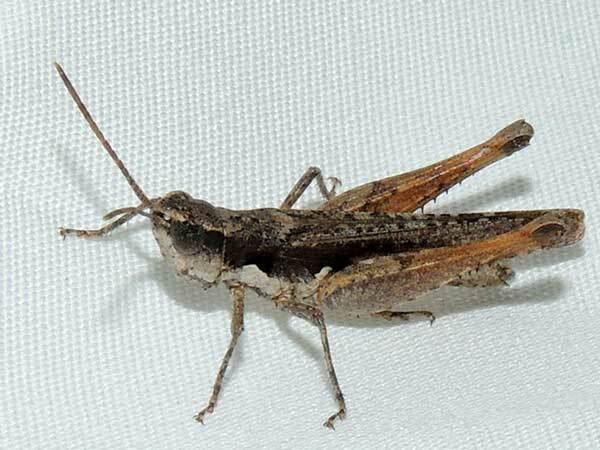 Among the many kinds of insects that come to lights at night are a few species of grasshoppers. Rackensack Wash, Maricopa Co., Arizona. 11 Aug. 2016. Slant-Faced Grasshoppers (sub-family Gomphocerinae) have profile with the top of the head angled anteriorly. This specimen was found at night when it came to a light set up in upper Sonoran Desert scrub habitat. This suggests that this insect might be active at dusk or even after dark. During the day it would rely on very good cryptic colors and patterns to sit still and rest until light and heat levels subside at sunset.